Why is it that there's a bazillion different types of screws? Why can't we just always use one standard screw type? Are there advantages/disadvantages to the different types? Are there times when one type is preferred over another? Help me understand why there isn't one screw to rule them all. The reason for the different styles is cost and torque. Phillips screws are self-centering, making powered screwdrivers possible. They're somewhat more expensive to produce than slotted-head. They tend to 'cam-out' easily under torque, making it hard to apply much torque. I've heard they were designed that way to prevent overtightning. However, it's not good for exposed fasteners to look stripped. Robertson-head and allen-head fasteners can handle more torque than phillips-head fasteners, but are more expensive. Because the bottom of the hole is flat (unlike the pointed end of the phillips), there's more contact area and so it's less likely to cam-out. The robertson-head is cheaper than the allen-head, but the allen-head has six points of contact rather than 4, making it less prone to rounding out the hole. The Torx-head fasteners solve the problem of rounding/stripping by having the flat bottom of the robertson/allen that reduces cam-out, but it has much better contact with the driving bit to prevent stripping the head. The points of the 'star' on the driving bit engage the recesses on the screw at nearly right angles, so it has a very positive contact. Torx is becoming more and more popular because of that, particularly in assembly-line work. Because they're less likely than a phillips to be damaged when tightening, the allen (internal hex) heads are often used for exposed ('decorative') fasteners on 'some assembly required' furniture. It's also very cheap to make the allen keys, so they usually include one with the fasteners. First, I really like Eric's answer for practical reasons. But there is another side to screw head diversity: Security. In the end, it's usually a temporary measure. Once a company invents a new screw, some third party will start selling tools to remove them. But for a time, any new screw design means the only people who can open your parts are "certified" workshops you've given tools to. Personally I see this a lot in electronic equipment, where the original manufacturer wants some aspect of design kept private or doesn't want after-market mods made to things they sell. Nintendo is particularly active in inventing new screws. Examples of security screws include 3-prong Torx variants, and Allen heads with a raised dot in the middle of the screw head to stop standard Allen wrenches from fitting. If you'd like to see a much more industrial version, find a car which has been booted and look at the bolt. I've seen circular bolt heads with an off-center circular hollow inside. No shoulders or slots to grab, you have to have a very specific wrench. And, of course, there are security lug nuts for car tires. Flat-head (slotted) screws are often considered the "junk" of screw heads, but one place they are slightly advantageous is wet applications. You can set the slot vertically, so it will drain out, instead of holding water. This can increase the life of the screw and the wood behind it. It's a very small point, but it's something. Same reason there different shapes and sizes of screws. It's because there is no single design of screw or screw head which satisfies all requirements. Even when the Phillips design came out there was almost immediate competition from posi-drive and others (most of which have since disappeared) because the Phillips design leaves a lot to be desired, such as the bit rising in the slots when the screw gets tight. Some designs, such as allen heads, have been around a lot longer and for most purposes are very superior but even then, a countersunk allen head of necessity has a rather small socket which creates other problems, such as a tendency to break the keys. Also, allen heads and other socket designs are mostly only used in hardened materials, which resist the tendency of the socket to deform under pressure. The reason we currently have so (relatively) few mainstream designs of screws is simple practicality. Nobody, merchant or user, wants to stock the massive number of screws we would need to have to use the best possible design for every possible application, so we compromise and use ones that are adequate in the majority of cases. All good answers provided so far. There are also self-tampering; i.e. security screws (one-way, star-bit, etc) that you'll see in public bathroom or on subway/train cars, buses, etc. These were prevented to keep people from disassembling structures, maliciously. There is even a specific drive (and material) that wooden boat makers like to use called Frearson flat head wood screws (silicon bronze). They look like Phillip drive but have a deeper recess which prevents cam-out. But the builder still gets style points for using bronze, Phillip-looking screws as opposed to using a square drive. So to answer your question in a few words: price, style, efficiency and material/durability. When people come up with improved designs, those start to get used. ...gives an advantage to more established designs (even if they are terrible), as production of those will be large-scale and efficient, so new designs (better or worse) will tend to be more expensive. As Chris Cudmore points out in a comment to a different answer here, this is the reason Phillips screws are more widespread than Robertson (square) screws, despite Robertson ones being generally better (far more difficult to strip the heads. ...and what was Ford's first choice again? ...exactly.). Guarding against vandalism (special washroom stall screws) and preventing theft (special car wheel lug nuts) are decent goals, but the motives are not always as good. (Is Apple just trying to protect users against themselves with pentalobe screws, or are there other, worse reasons for them, such as pushing more people back Apple for any repairs?) The tamper-proof requirement is pretty clearly at odds with what most users would want, though, as each variation means another set of screwdrivers or bits someone would need to own to be prepared. 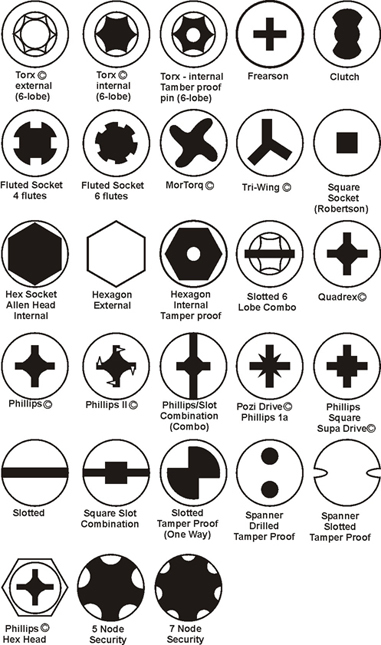 Of course the fact that the designers of these screw heads often make money off each screwdriver or bit sold points to that being one reason the screw is out there in the first place. To end on a positive note after all of that, the different applications of screws really do leave room for multiple "best" designs. The points about wet applications and applications with small countersink-type heads (which can only fit much smaller bit sizes of the grippier designs) are great. Actually, triangle heads should be best. They should have the best torque (as long as the sides are vertical), while still being simple to cut (low manufacturing costs). I just looked up whether they exist, though, and apparently they are being used as yet another tamper-proof design. Not the answer you're looking for? Browse other questions tagged tools screws or ask your own question.